Vudu has launched a new offering called Vudu Movies On Us. This lets you watch thousands of movies and television shows for free with “limited commercials”. Which is something we can all put up with if it means we get to consume content for free, right? 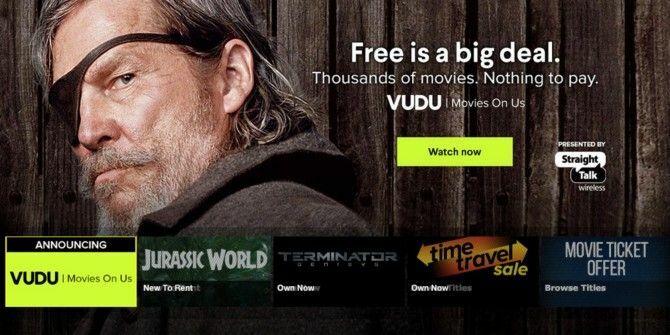 Vudu Movies On Us is a collection of movies and TV shows available to watch for free. In this case, free means having to put up with the occasional advertising break, as these titles are all ad-supported. The movies and TV shows on offer come from the likes of Paramount, Warner Bros., Lionsgate, and MGM, and many more. Films available at launch include Mad Max, True Grit, Abduction, and School of Rock, to name just four. Vudu is a offering a sweet deal here. Although a Vudu account IS required, you don’t even need to have payment information on file to access the free, ad-supported content. So while Vudu’s ultimate goal is to draw you into buying or renting other movies or TV shows, at least it isn’t being too pushy about it. There will, as always, be people complaining about advertising 4 Alternative Models To Advertising That Are Working Right Now 4 Alternative Models To Advertising That Are Working Right Now Advertising shouldn't be the only way for content producers to make money. Luckily, it isn't - plenty of reputable organizations fund themselves without ads, online and off. You, the readers, had a few things to... Read More . However, sitting through the occasional ad here and there is surely preferable to paying cold, hard cash for the privilege of watching flicks. The difference being that Vudu Movies On Us is a legal option enabling you to do so while still paying everyone involved. Unlike piracy. To access Vudu Movies On Us, log in to Vudu, click either the “New” or “Spotlight” tabs, and then click “Movies On Us”. You’ll then discover thousands of movies and TV shows available to watch for free with limited ads. Will you be watching Vudu Movies On Us? Are you happy to put up with ads if it means you can watch movies for free and (crucially) completely legally? Do you prefer this kind of setup to Netflix or Hulu, which require a monthly subscription? Please let us know in the comments section below! Explore more about: Media Streaming, Vudu. I do have an account and have rented and purchased from this company. Very pleased with this concept. However, I must be honest and say that had I researched this company beforehand and had I known it was affiliated with the Walton family, I would have chosen another service. I understand it is a large company and I don't feel as if cashiers should become wealthy people, but I don't appreciate individuals at the top taking in the amount of money they do on a daily basis. I do understand investors enjoy a return on their investments, but there needs to be consideration for the common employee. That is what is breaking the back of our country; lack o concern for the well-being of the common man. Stop looking for loopholes and pay your share of taxes to keep America great. Thanks for letting me voice my opinion. Of course is a U.S. only service, I wonder if people have any luck using a VPN with it? I do not mind a few ads on a service, but I do think TV is pushing people alway with all the ads they try to put on. Think some hours of tv are mostly ads with a little bit of show to break up the ads. Well said, I completely agree.